A rustic campsite along the shores of Lake Audy in Riding Mountain National Park in Manitoba, Canada provides the ideal location for a family vacation. During the sunset hours, a father spends some time with his two sons and shows them how fishing is done from the wharf. The wharf at Lake Audy in Manitoba, Canada extends out into the water providing a prime location for fishing, especially for the younger children where they may be able to snag a northern pike, walleye, trout or perch. To top off this precious moment, the sunset colors create a brilliant backdrop which span the horizon as the sun dips behind the hills on the other side of the lake. There are several lakes found in Riding Mountain National Park making endless opportunities for families on vacation to spend some together fishing. A father who loves to fish can pass down his knowledge and experience to his sons which will carry these bonding moments on for generations to come. Picture of a father and his sons fishing from the wharf while vacationing at Lake Audy in Manitoba, Canada. 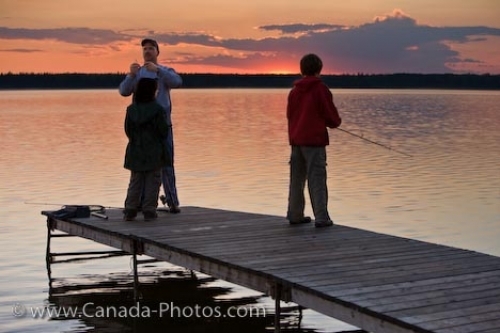 A Father with his two sons fishing at the end of a wharf on Lake Audy at sunset, Riding Mountain National Park, Manitoba, Canada.